Off on a Mini-adventure before we had a chance to take a photo! "Fast, efficient and very friendly. Sean had a little accident with a car door - luckily the car was okay! "I thought the appraisal was thourough and covered all the car needed, not over the top, service was good. Felt that you actually cared for the car like it were your own. Very pleased with end product, even concentrated on areas I didn't expect, well done!" "P.S. Hope your thumb's OK Sean." "Rang on Tuesday and wrongly needed Bronze clean by Thursday morning. Arranged appointment for Wednesday PM. On arrival after discussing exact requirement a Silver package was recommended, which more adequately catered for requiements. Also needed to keep vehicle until Thursday AM to do job correctly. On arrival Thursday AM vehicle looked superb and all aspects required had been undertaken. Very satisfied with the servce throughout and would recommend to friends. " 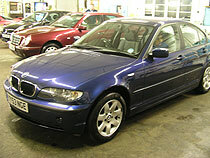 "Very good service, 2 dents which were an eye-sore have been totally removed, car looks good as new. Well worth the money. " Fantastic customer service and care. Impressive service! Will be coming back again! "Advised exactly what I needed only, and never pushed anything else - I didn't even need to drop the hint that I used to valet for a living! (and you don't even sell shoes!) "
"The valet was carried out to a very high standard with a full explanation of everything being done along with a detailed cost breakdown. Would definately recommend to any one looking for a professional finish to their car." "From start to finish I was impressed, the courtesy, the helpfulness, the advice, of all I dealt with was a real suprise. I will be coming back." After having concrete splashed over my car I didn't think anyone could get it off -- I was wrong! Edward did a fantastic job. So much so, I didn't want to drive her home. Grateful thanks to Gary and his team. Top Stuff." "I am very impressed wth the level of Service provided by Clean Image. My car looks better than when I bought it. I would recommend using this company and will definitely be using them again. "